Last year's gay coming-of-age tale, Moonlight, won the Best Picture Oscar at the 89th Academy Awards earlier this year, but the occasion was overshadowed when La La Land was mistakenly announced as the winner on stage by Faye Dunaway. 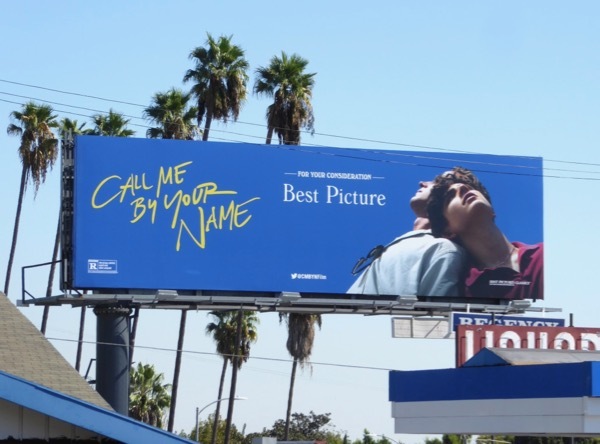 This awards season gay love story, Call Me By Your Name, is also hoping that it will be considered for the Best Picture category. The romantic drama directed by Luca Guadagnino adapts André Aciman's 2007 novel of the same name about the summer love affair between a 17-year-old American-Italian Jewish boy, 'Elio Perlman' (Timothée Chalamet), and a 24-year-old visiting academic and his father's research assistant, 'Oliver' (Armie Hammer), who comes to stay with his family at their villa in Northern Italy in the 1980s. 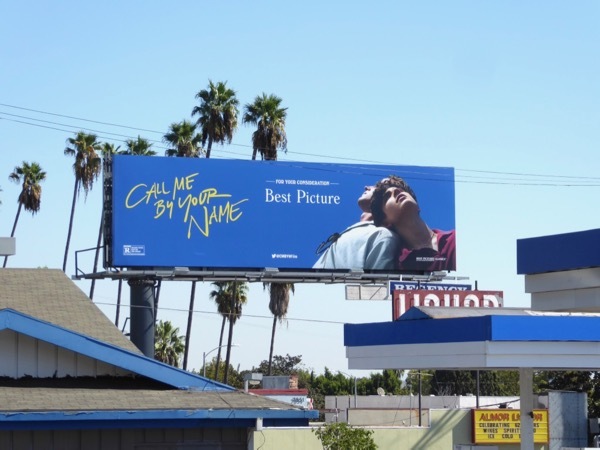 This billboard for the movie was photographed along Sunset Boulevard at Fairfax Avenue on October 25, 2017. 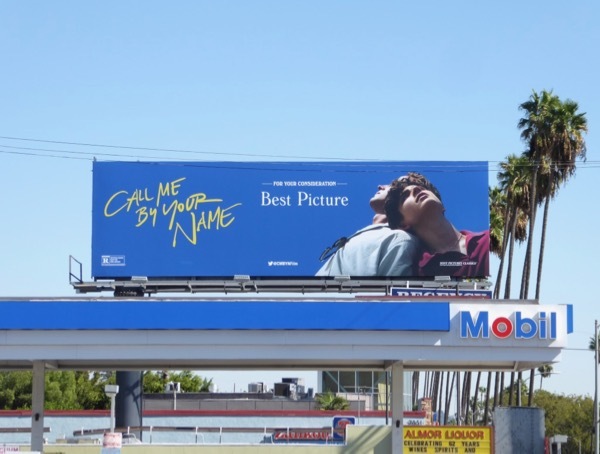 Armie Hammer fans can also enjoy these film billboards for The Lone Ranger and these movie billboards for The Man from U.N.C.L.E. 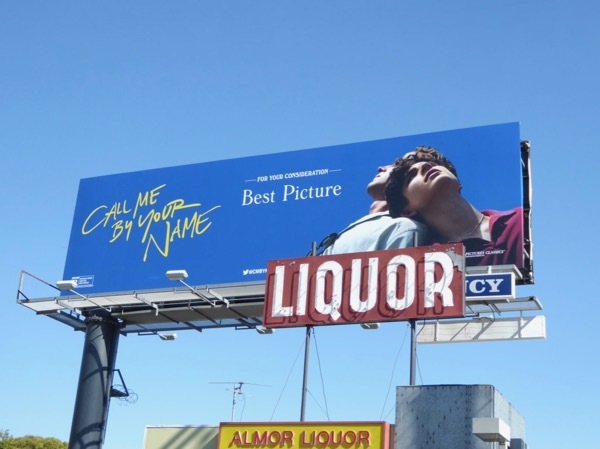 It's nice to see more LGBT stories on the big screen, but only time will tell if this tale of young love will be nominated for any awards this season. 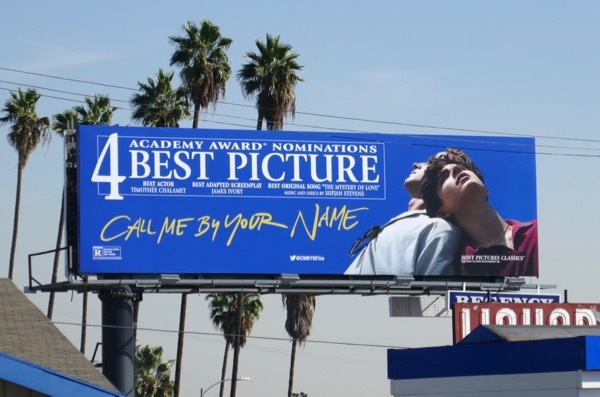 UPDATED: Congratulations to Call Me By Your Name for garnering for Academy Awards for Best Picture, Best Adapted Screenplay, Best Original Song and Best Actor for the very deserving Timothée Chalamet. 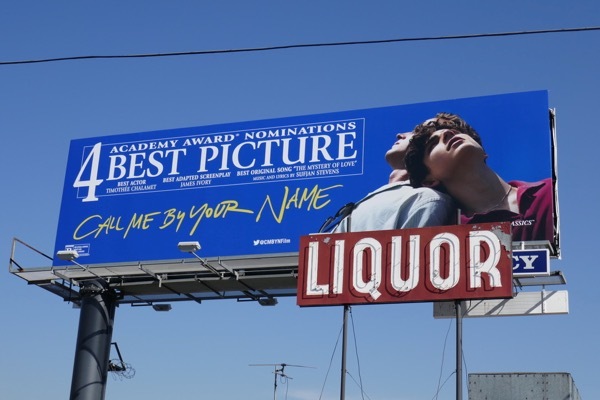 Let's hope this Academy Award nominations billboard photographed in the same Sunset Boulevard location on January 31, 2018, helps the queer romance take home some Oscars.